WHY SHOULD YOU HELP THE WOUNDED WARRIOR PROJECT? Hello and thank you for taking a few minutes to read this message. For those of you who don’t already know me, my name is Matt Cavanaugh, and I am a Captain in the U.S. Army (West Point, 2002). In the two tours I served in Iraq, I saw several of my fellow American Soldiers suffer devastating wounds, and I have personally watched the resulting impact on their lives and the lives of their families as they struggle to recover. I am writing this to ask you for your help because our Nation’s most severely wounded Soldiers, Sailors, Airmen, Marines and their families desperately need our help. Over the course of the next year, I am dedicating myself to raising money for the Wounded Warrior Project, which is a non-profit organization whose core mission is to honor and empower [severely] wounded Warriors. In a similar fashion, I want to help the 30,000+ Veterans of the wars in Iraq and Afghanistan who have returned home with limbs lost, severe scars from burns, Traumatic Brain Injury (TBI), and Post Traumatic Stress Disorder (PTSD), by pushing myself beyond my perceived physical and mental limits in their honor. During the recovery process, America’s Wounded Warriors are pushed beyond their physical and mental limits on a daily basis, and their families struggle to help them as all of their lives and dreams are forever changed. The most severely injured Warriors simply need more help than the government has been able to provide them, and I feel compelled to help by taking on this challenge. Tucson Marathon (26 Miles) Tucson, AZ. 7 December 2008. Old Pueblo 50 Miler (50 Miles) Sonoita, AZ. 7 March 2009. Ice Age Trail 50 (60 Miles) La Grange, WI. 9 May 2009. 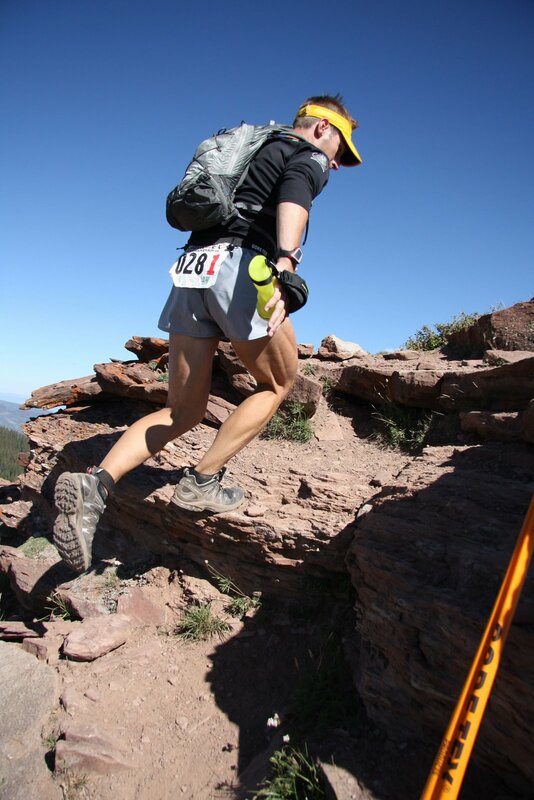 TransRockies Run (114 Miles) Colorado Rockies. 23-28 August 2009. This schedule adds up to 250 cumulative miles over 9 days of competition, which will work out to just under 28 miles per day. Due to military obligations I may be forced to modify one or more of the events in which I am planning to participate, but in that unlikely event I will schedule a replacement race in order to cover the miles that I am committing to run in honor of my wounded comrades. So, how can you help? I ask that you consider supporting me as a “Team Wounded Warrior Athlete” for one, two, three or all four of these events with donations of at least $1 a mile for each race/distance: Tucson-level ($26), Pueblo-level ($50), Ice Age-level ($60), TransRockies-level ($114), or Wounded Warrior Hero-level ($250). One hundred percent of your donation goes directly to the Wounded Warrior Project, there is no “middle-man.” All training, travel, and race expenses (estimated to be $5,000-$7,000) will come out of my pocket – not your donations. You may ask: “Why isn’t Matt just donating that amount to the WWP?” Good question. My sincere hope and belief is that my “seed money” can and will grow many times over by seeking your assistance to this important cause. Additionally, I’m reminded of the African proverb: “If you want to go quickly, go alone. If you want to go far, go together.” Our support, together, can make an important difference in the lives of these severely wounded men and women. I humbly ask you to join with me in support of our Nation’s severely wounded heroes and their families. They are volunteers who have served for all Americans, and I ask that you please help me repay them in this small way for their tremendous personal sacrifices – we must not forget them. To make your tax-deductible donation to the Wounded Warrior Project, click on the hyperlink below to get to the Wounded Warrior Project secure server. On the left hand side of the screen, you’ll see a section for “Visitors” (highlighted in red). Under “Visitors,” click on “Sponsor Participant.” The screen will prompt you for my name, just type in “Matthew Cavanaugh” – this will link you to my supporter’s page. Donate away! Do some good! Thank you! CPT Matt Cavanaugh’s Team Wounded Warrior Project Page. If you happen to be receiving this via real paper copy, and not email, the above hyperlink will not work. In that case, go to www.mattcavanaugh-teamwwp.blogspot.com. You will be able to hyperlink to the donation site from here as well. Matt will publish regular updates on training and races as the year progresses. If you have any questions regarding the Wounded Warrior Project, or difficulties completing the donation, contact me, CPT Matt Cavanaugh at matthew.cavanaugh@us.army.mil. Or contact my friend, supporter, and fellow Veteran: Mr. Tom Cocchiarella (USAF 1971 – 1975) at: tomcocch@yahoo.com. Next post:Tucson Marathon — Team WWP Event #1 — 3rd Place Overall!